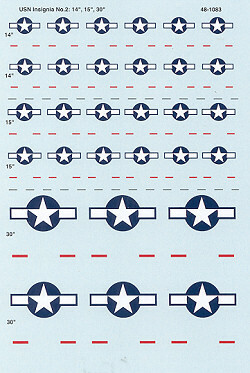 Insignia sheets are always useful and this is the second recent sheet for USN subjects from Superscale. Of course, you can use them for USAF aircraft as well, and thanks to Superscale now providing the red bars as additions (to prevent problems with mis-registration) the sheet is useable for a much wider range of aircraft. The sheet provides insignia in three sizes; 14 inch, 15 inch and 30 inch. These are quite useful for more modern USN aircraft in the full color schemes.